In the 1851 England Census we find the widowed Ann Paulson living at 'Church Yard Side' in Mansfield. She was then about 40 years old and had been born in Papplewick where her father John was long-serving schoolmaster. Sure enough, she is not only 'Head' of the household, but also given the profession of 'Artist'. There were eight other people in her house, including her sister, Sarah Dawn (48) and 18-year old son George, 'Apprentice to a Bookseller'. The bookseller in question may well have been Robert Collinson, who published the book which included Ann's adverstisement, in nearby West Gate [See Christina Rossetti in Notts on this website]. Ann had two pupils of her own living there, her nieces Mary and Ann Dunhill, aged 11 and 9 respectively. They employed a 17-year old live-in servant, Sarah Bottom, and there were two lodgers, the Curate George William Bramold (aged 33) and another bookseller called Thomas Clark (27). Finally Ann's Mother-in-Law, Rachel Paulson was there, then aged 70. Ten years earlier Ann's husband John, an Attorney's Clerk, had been living at Church Side with his mother Rachel and son George. Ann was not at home in 1841, but may have been the 'Anne [sic] Paulson' listed that year as a 'F[emale] S[ervant]' in the large Baker household (Richard, Elizabeth, 3 small children and 6 servants) in Ruddington. She was the right age and born in the county. If so it would have been hard for her suppressing her artistic talents while acting as a servant and being away from her husband and 8-year old son. In White's 1844 History, Directory & Gazeteer of Notts Paulson Anne appears under 'Academies' in Mansfield, specifying that she taught drawing at 'Church sd'. She appears as Paulson Mrs Ann, Churchside in the 1853 White's, but with no profession mentioned. By 1864 she is still in the 'Miscellenay' list, now living at 47 Leeming Street (though not (yet) found in the 1861 Census). The two paintings shown, both in Mansfield Museum, illustrate Ann's artistic versatility. 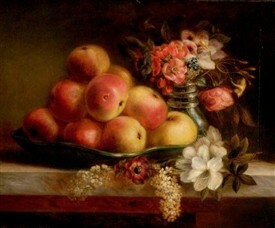 Her Apples and Flowers still life is in a Dutch 17th Century style. The Victory Arch almost certainly commemorates the passing of the Reform Act in 1832, a cause dear to Nottinghamshire people's hearts. The flag which mentions 'A tear of sympathy for Poland' is particularly interesting since it refers to the unsuccessful Polish uprising against their Russian occupiers which had taken place earlier that decade. George Langley is listed in the 1844 White's Directory under 'Booksellers, Printers, Paper Hangers, &c.' and you can clearly see wallpaper samples hanging in his window on the right. 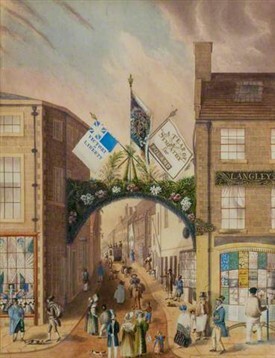 Since his address was 'Market place', this view must be looking up Westgate from the old market place towards where the new (1840s) one now is, Langley's and the shops on the right being where the Library and Four Seasons Centre are now to be found. The location is looking up Leeming Street from the Market Place. The error you have made is not realising that there was always a market place at the bottom of Leeming St in 1840 this was enlarged from a triangle which can be seen by looking along the front wall of The Swan towards the Moot Hall. The Market Place on Westgate was the Livestock Market and this became "The Old Market Place" when the Livestock Market moved to Nottingham Road. the old refers to it being an ex market place rather than being the oldest market place. I'm new to this site, from NZ, and I am related to Ann (Dawn) Paulson, through my great grandmother, Jane Dunnell, (mother Catherine Paulson) who left her home and married Henry Maxwell David Mathews, my great- grandfather! I notice from the post, that Ann was not found in the 1841 Census! BUT.... I found her in London, listed as an art student! I hope this is helpful! I'm just trying to find the correct place to post the photo I have of the census entry! Any advice please?? Thank you! I'd love to hear from any relatives that may be interested in my research! I just got my DNA results back, and they include Scandinavia, Sweden, (Paulson)!